Hunting Story of the month….September! So I go to Bridgeport Texas for a couple days to hunt pigs. No pigs at all are showing up the first day, but I decide to try one more day. I get into the first of two stands near feeders on this farm. I get settled in at about eight thirty in the evening or so and remain there till about three thirty or four in the morning. Nothing. I leave, go into town and grab a bite to eat and some redbulls to keep me going for the rest of the night. I get back to the second stand grab a small pistol, which I never do, my long range rifle setup and a short range rifle with night vision. Earlier that day I had seen a rather large serpent laying by the side of the road and thought I really need to be careful walking around in high grass in the dark. I had parked my jeep about two hundred yards away from the blind and was walking with my headlamp on paying close attention where I stepped. There is a tree line that runs east to west and the blind faces east. As I’m walking to the blind I glance up into the tree line which is just a shadow in the dark and notice my headlamp light reflect off of two rather large eyes that appear to be set about four or more inches apart, and about eight to ten feet off the ground…….. How odd! I put down my stuff and flip on the night vision just in time to see the eyes appear to turn off to the right (east) and disappear. Must be a big ol’ bobcat. Still I grab the little pistol in my right hand since my reaction time will be a bit quicker with that. Just in case…. Note to self. Bring tape to tape your pistol to your hand in case of a nasty close quarter fight with a big cat. Wouldn’t want the thing flying out in high grass. As I get closer to the stand I’m still lookin down, and lookin up, lookin down and lookin up. Don’t want any nasty surprises. Sure enough as I get about fifteen yards form the blind I look up. Directly through the trees about another twenty or thirty yards past the blind and there are those two glowing eyes again. Hmmmm. Lets try this again. Up with the night scope and eyes disappear again. NICE! So I get into the stand and realize that some past hunter has decided to kick the lower half of the front wall out and it’s warped over time to the point that there is just a gaping hole in the front of the stand. Even NICER! Lucky for me I always carry my shooting blanket. It’s just a big old wool blanket that I use as a shooting mat. I know at this point what your thinking, but you gotta work with me here. I had very limited options. So I grab a chair that’s in the stand, and hang the blanket over it, then hang it a against the window and place the whole deal in front of the big hole in the wall. My logic is if my glowing eyed friend decides to make a run at me he’s probably not gonna slow down and gingerly try to slither around the blanket. At which time I’m hoping he would get his claws or something else sharp and nasty hung in the blanket. Then while he’s untangling himself I can get a blade or a couple bullets in him. Like I said, I had limited options. The rest of the night is seeming like it’s gonna be pretty uneventful, but I keep a sharp lookout just in case. Not long before the sun comes up I start to hear some pigs grunting and tearing stuff up like pigs do. The sounds are headed straight for the feeder. I get my night vision up and get settled in. About that time one of the pigs screeches like the he just saw Satan. That sound lasts for about ten seconds. Then silence. No big catch roar, definitely no more pig grunting and coming out for me to shoot. MAN, I’m really not liking this blasted cat right about now! So I wait till about eight just to see if maybe something will show up and of course nothing does. I straighten up the blind, something past hunters obviously neglected to do, and take off. Well I drop by Stick’s (my gunsmith) shop and a friend of mine named Monty is there. I’m telling this story about seeing these eyes and Monty asks “Were you near Jacksboro”? Yea, I say. So he goes on to tell me how people are saying there are some mountain lions in Jacksboro killing deer and so forth. 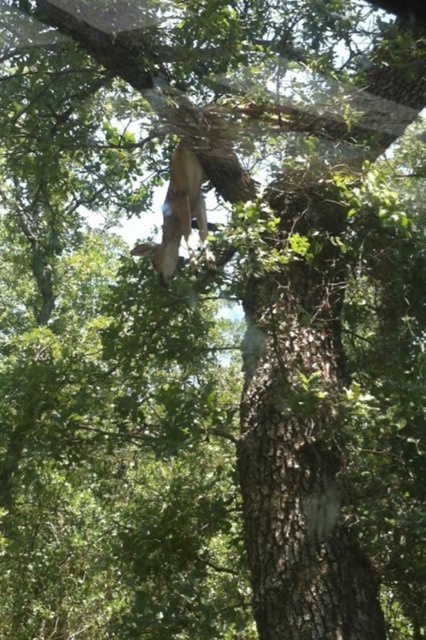 As a matter of fact a girl he works with snapped a picture of a full-grown deer stuck about twenty feet up a tree near her home. I’m no wildlife biologist, but last I checked deer were not in the habit of climbing trees. Now according to local knowledge mountain lions don’t usually drag stuff up trees either, but I don’t have enough info to comment on that any further. I attached the picture so you could see for yourself. It’s not the best quality because she shot if from a camera phone and she was somewhat reluctant to roll her car window down. Anyway, I figure I should tell the owner that he might have a really big bobcat or a mountain lion on his place. I call him and he said “ oh yea, did you see it?” I told him, “not quite, but close enough to call it good”. He said that another guy had walked across that same field a few nights ago and when he came back and could see his tracks had big cat tracks inside them. In addition to that they caught a wild pig in one of the traps and something had beat the crap out of the trap trying to get at the juicy pig inside. So the landowner invited me back if I wanted to have a go at the cat….. As you read this I am probably studying mountain lion behavior or trying to develop some protective equipment for that little mission. LOL.